I woke up earlier than I would have liked this morning. M woke with the roosters and J was up shortly after him. Since J woke up a little earlier than usual he hasn’t wanted much to do with anything unless he is nursing or being worn. But, today was a good day. We still went out and about. When we go out, I always make sure to carry a few essentials in my bag ALWAYS! 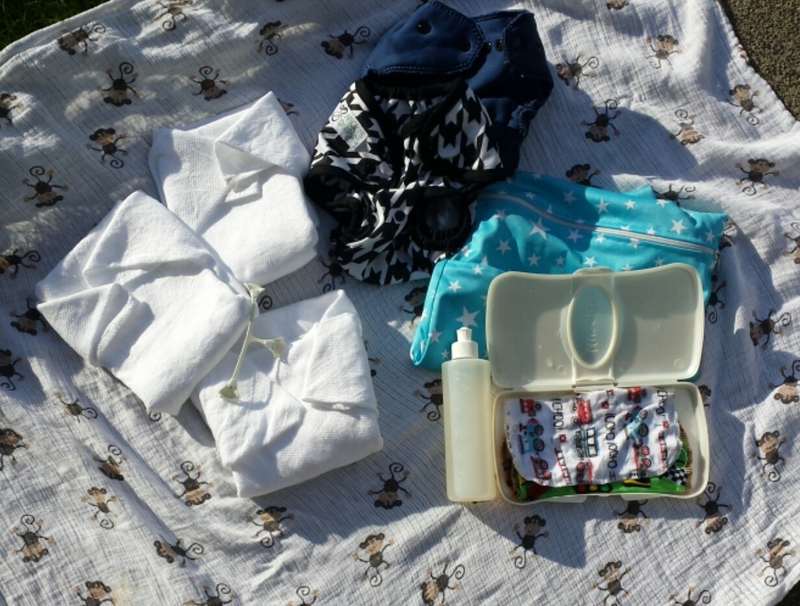 I take 3 flat diapers with me because I have found that to be a good number. There have been times where we have been out and J will poo, I change him, and he poops again. I figured it is necessary to have at least 3. A snappi to hold the diaper on him. He typically is already wearing the snappi so I rarely ever have to carry it. I carry a wetbag that has 2 pockets. The outside pocket, I use for wipes, cream, diapers etc. Basically whatever I put in there. The main larger pocket I use for all soiled diapers. Keeps my diaper bag from messes and smells. If I forget the wetbag (which I often do) I will use a plastic grocery bag or zip lock bag. I usually have one or the other in my car. Wipes. Wet and dry. You can never have enough wipes in my opinion. I keep the wet ones in the container and the dry ones float around in the diaper bag. It isn’t fun trying to clean up a huge poop with 2 or 3 wipes. Peri bottle with water. This comes in handy believe you me! If I forget wet wipes or the mess is huge, I know I have enough water to clean him up. 2 extra covers. Typically J is already in a cover so that makes 3 unless he soils one. I like to have 2 so that way I know he will have a clean cover. Hopefully! These are the items that are with us all the time. Sometimes I forget things, so I have gotten in the habit of making sure all these items stay in my bag. What items do you always have to have? This entry was posted in Uncategorized and tagged bringing back flats, cloth, cloth diapers, diaper bag essentials, flats challenge, go green, natural parenting, organic, using cloth diapers while out. Bookmark the permalink. ← Would I see cloth diapers as an option if they weren’t modernized and we didn’t have a washer and dryer?